In researching another topic, I came across this video biography of Nancy L. Scott. I’d really like for everyone to know about this lady. 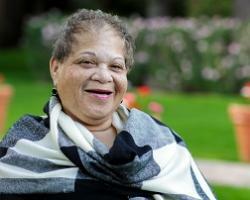 She’s a real champion for dialysis and transplant patients and I believe she’s done more for us than we’ll ever know. She’s an inspiration for me because when I think I can’t go any further or do anything more, I look to what she’s done and how much she has given and I find that extra energy to go just a few steps further. This video from Dialysis Patient Citizens was part of the Inaugural Gala for the DPC Education Center on March 11, 2014. It summarizes Nancy L. Scott’s contribution but nothing can ever fully describe how much she’s done for us. I’m sure all dialysis patients are in a better place because of Nancy’s superhuman efforts. To watch the video, CLICK HERE. This video was part of the introduction to the Nancy L. Scott Award for Patient Education and Public Service. This entry was posted in activism, dialysis, Dialysis Patient Citizens, kidney, lobbying, politics, thankful, thoughts, World Kidney Day and tagged Activism, dialysis, Dialysis Patient Citizens, education, ESRD, hemodialysis, kidney, kidney transplant, lobbying. Bookmark the permalink.